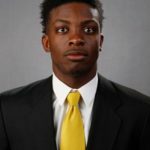 Iowa forward Tyler Cook may play on Saturday when the Iowa Hawkeyes host 16th ranked Ohio State in Big Ten play. Cook missed Wednesday night’s 73-63 win at Northwestern with a sore knee but was expected to practice Friday afternoon. Cook is Iowa’s leading scorer at 17.3 points per game and the leading rebounder at 8.3 per game. The Hawkeyes are 2-3 in the league race. The Buckeyes are 2-2 after an upset loss at Rutgers.